If you are like most people, then you probably use an Apple iPhone on a regular basis. Now, the great thing about these smartphones is that they are incredibly powerful which means that you can use them for virtually any purpose. 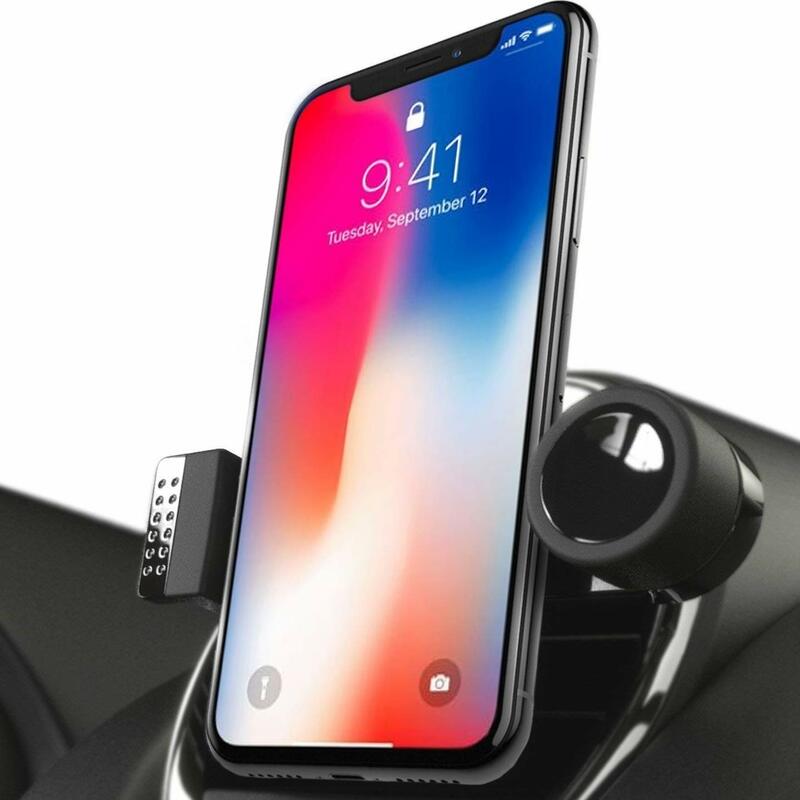 This, combined with the fact that these devices are incredibly pricey, means that choosing the best car iPhone holders is incredibly important. Not to mention, they may be legally required as well. Actually picking out the best from all of the holders on the market, though, isn’t the easiest task. There are so many different makes and models available, that it can take you ages to sort through this collection. Not to mention, there are actually very few holders that actually live up to their claim of being the best. Since we decided to handle this mammoth task for you, you don’t have to do any of the heavy lifting. Instead, just read through our reviews and buyer’s guide to ensure that you are able to choose your car iPhone holder without any issue at all. Model Compatibility: the first thing that we looked at was what iPhone models each holder was compatible with. The more models that the holder could keep stable, the better. This feature was largely determined by just how much the holder could be withdrawn and extended. Mounting Fixture: we then examined the fixture that held the iPhone holder in place. We looked at all the various types of fixtures available and considered the advantages and disadvantages of each design. The fixtures that were most robust were rated higher. Stability: we also determined just how well the phone could be held in place once it was in its holder. A stable phone is easier to view thus making it an important element of any good holder. User-friendly Features: last but not least, we determined just how simple the iPhone holder was to set up and how easy it was to use the phone once it was in its cradle. 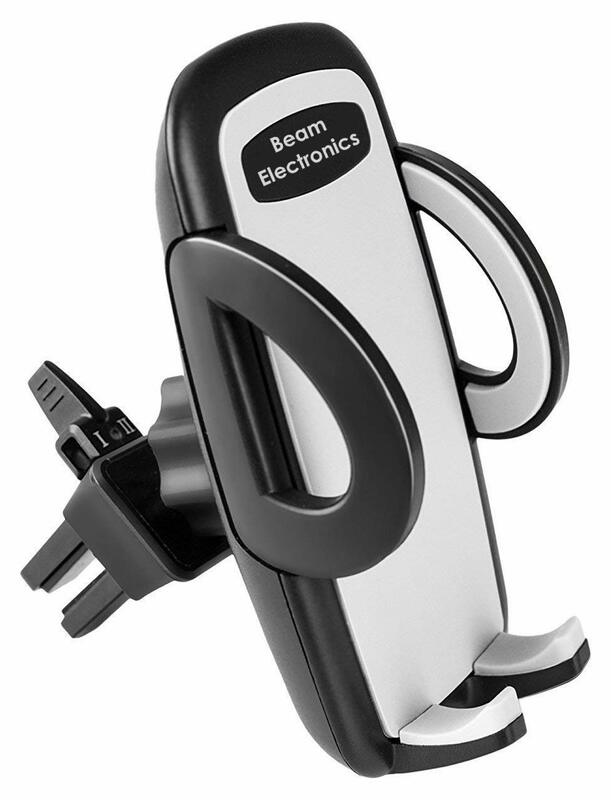 Why we like it: The Beam Electronics iPhone Holder is a firm and sturdy cradle, excellent for keeping your phone safe and secure. 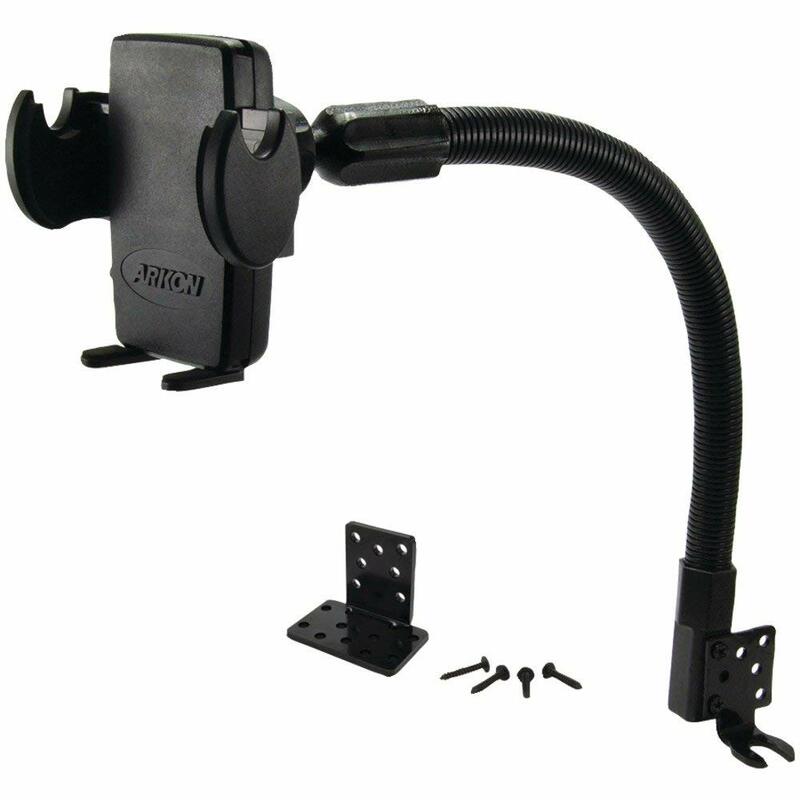 This iPhone holder is equipped with adjustable arms, allowing the width to be set from 1.9 to 3.7 inches. As a result, it is capable of holding up a large variety of the newer iPhones. If you have an iPhone 5S, 5C, 6S, 6S Plus, 7, or 7 Plus, you will find that the holder will be compatible with them. The holder can be easily mounted on your air vents in the car and has been specifically designed to be suitable to both horizontal and vertical vents. Due to the placement of the holder, you can be certain that you will have a great view of your phone, while also ensuring that your driving view isn’t obstructed in any way. Also, since there are two clamp settings, you can adjust the size according to the width of your vents. The only real issue with this mounting mechanism is that it can block the vents. So, in the winter or the summer, this may be a problem. On the upside, this is an incredibly sturdy holder. Once it is fixed in, you don’t have to worry about it slipping out or falling over. What’s more, the stability of the holder is passed down to the cradle as well. It holds your phone firm, making certain that the screen doesn’t vibrate too much, even when you are driving on especially bumpy roads. This iPhone holder is easy to use from start to finish. The first thing that you will notice is that it is very simple to install and will only take you a matter of moments. Not to mention, once it has been set up you can rotate the attachment knob so that the holder is angled in a way that is easy for you to see. Of course, since the screen is so steady, you can also be quite certain that it is a breeze to see and use the screen. Last but not least, your phone can be detached from the holder with just a press of a button. 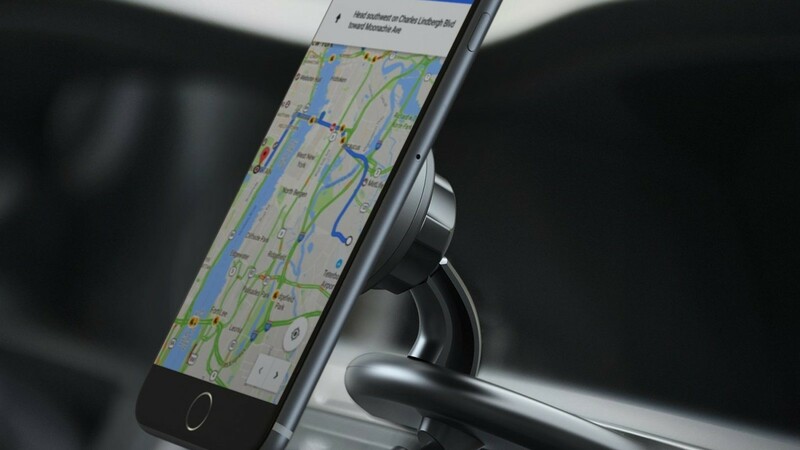 Why we like it: The Penom iPhone Holder ensures that your phone will remain firmly in place, regardless of the roads that you are driving on. The arms on this iPhone holder can be extended or retracted, depending on the width of your phone. As such, the cradle can vary from about 1.9 inches to 3.7 inches in size. Due to this, you can essentially fit most newer iPhone models in the holder. This includes iPhone 5C, 5S, 6S, 6S Plus, 7, 7 Plus, 8, 8 Plus, and X. The holder is designed to fit into the air vents that have either horizontal or vertical bars. 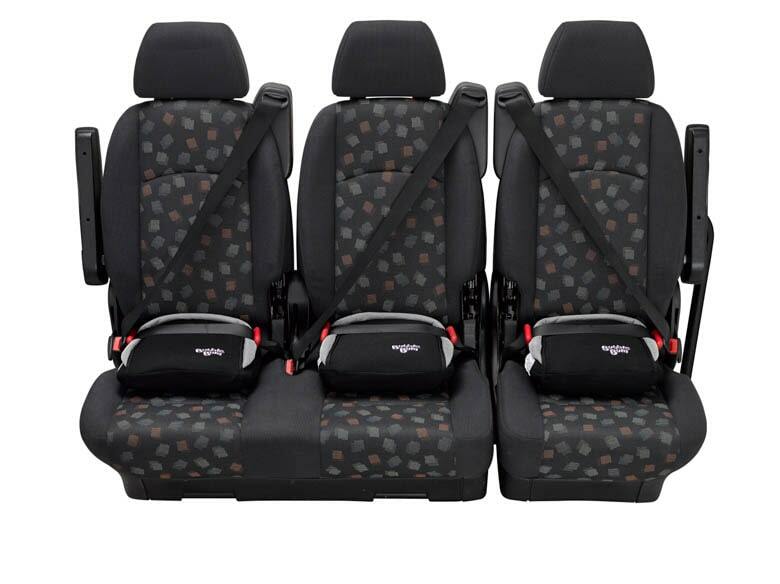 It has three size settings which means that it is well-suited to a wide variety of car vents. What’s more, this iPhone holder ensures that your view will not be blocked in any way while you are driving. Despite all of the advantages associated with this mounting mechanism, there is also no denying that it can block the vent. So, if you need to use the air conditioning or the heater, then you may need to move the holder. The clamp on the holder guarantees that it stays firmly attached to the vents at all time. So, even when you are driving on rough and uneven roads, you can have peace of mind knowing that your phone is not going to budge at all. On a similar note, the cradle is just as stable as the rest of the holder. It keeps your phone in place, making it quite easy to see everything on your screen. The design of the holder ensures that you will have the holder set up and working in no time at all. Also, after it has been fixed in, the knob allows you to adjust the angle of the holder so that the cradle can be turned to a position that is most comfortable and useful for you. On top of this, at the back of the cradle, there is a release button that lets you detach your phone without any issue at all. Why we like it: The Tackform Solutions iPhone Holder is a compact product that makes it easy to keep your phone in place at all times. The holder is designed with a spring loaded arm that allows the cradle to stretch to accommodate phones of various widths. This allows the cradle to lengthen from 2 inches to 3.6 inches, making it suitable for the newer and larger phones on the market. So, you can easily fit your iPhone 6S, 6S Plus, SE, 7, and 7 Plus. The mounting mechanism on this iPhone holder is a suction cup. Therefore, you can easily stick it onto your dashboard or your windscreen, depending on which offers you a more comfortable view. This design also means that while the holder will stand firm, it is also a lot easier for you to move about. The only real flaw with this holder is that on very hot days, there is a chance that it may lose its suction properties. 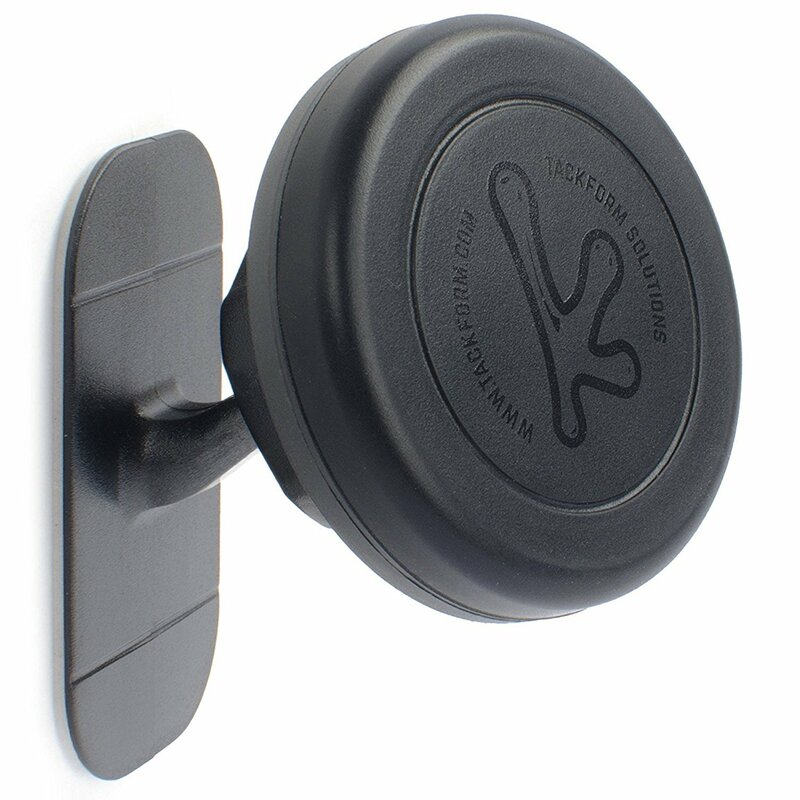 This holder boasts a larger-than-average suction cup on the bottom. 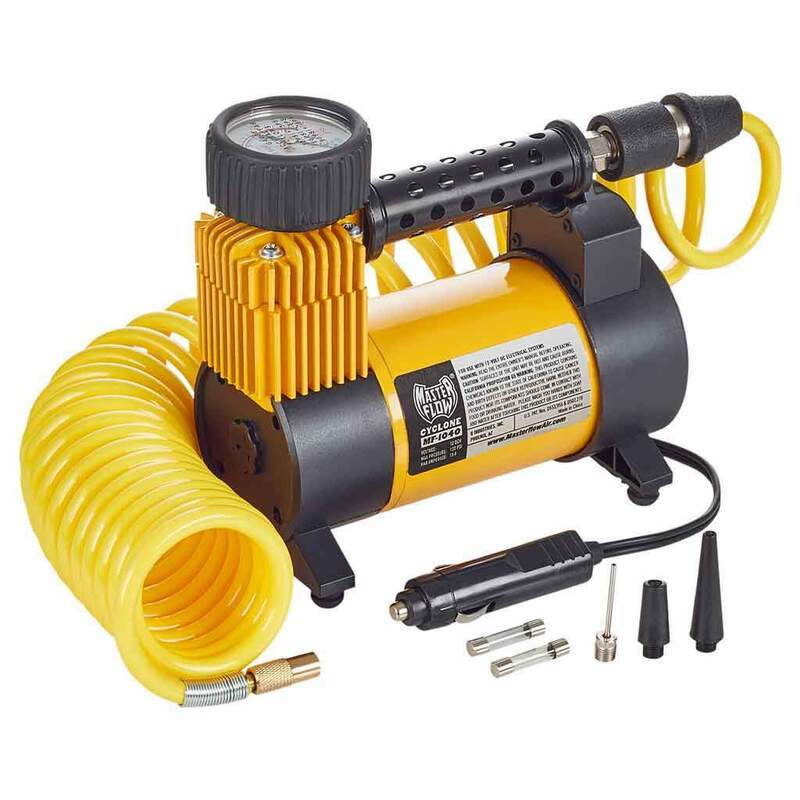 Thanks to this, you will find that the suction power is a great deal stronger, keep the holder in place without any problem at all. This continues to be true even if you are driving on rough terrain. Also, because this holder is so rigid, it completely does away with vibration. This is further improved by the remarkable grip strength of the cradle. You will have absolutely no issue at all, trying to view your screen while you are driving around. The suction feature on this holder means that it is an absolute breeze to set it up. Furthermore, the adjustable swing arm makes it rather simple to adjust the cradle into a position that is more suitable for your line of vision. Last but not least, the cradle of this holder makes it easy to push the phone into place and then retrieve it, with just one hand. 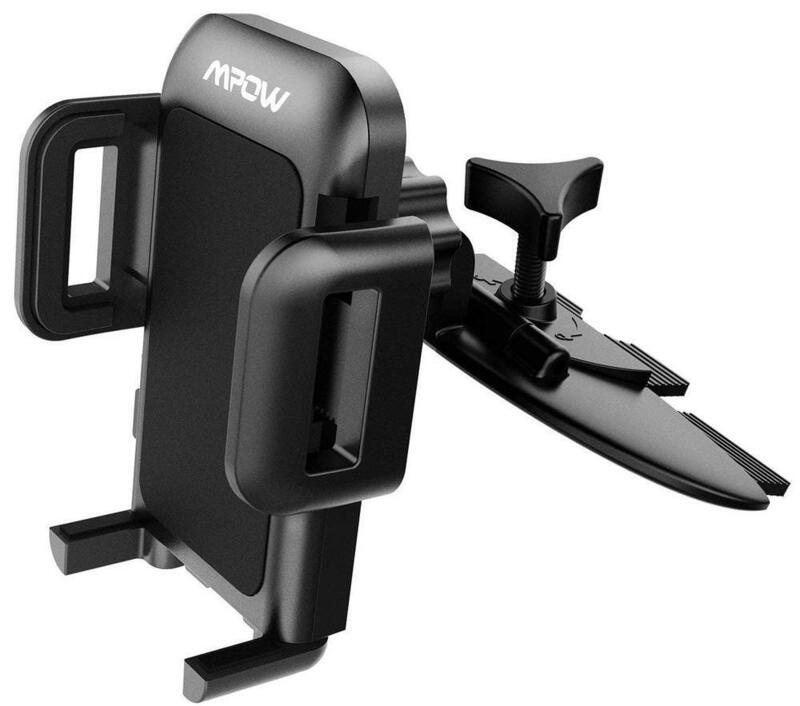 Why we like it: The MPOW iPhone Holder is a secure product that ensures that you have a great view of your phone screen at all times. The arms of this iPhone cradle can be stretched from a width of 1.58 inches to 3.54 inches. Due to this wide range, the holder is able to keep a much larger variety of iPhone models in place. For instance, you will find that the iPhone 5S, 6P, 6S, 7, 7 Plus, 8, 8 Plus, and X are just some of the models that can fit the cradle. This holder’s mounting mechanism allows it to be placed inside the CD slot. The features on it ensure that you can easily adjust the width to fit various CD slots. You can also lock the holder in place. For the most part, this is an excellent feature as most people don’t use this particular part of the stereo system anymore. However, due to the placement of the holder, you find that several other functions are being blocked. To reach these, you would need to change the position of the cradle. 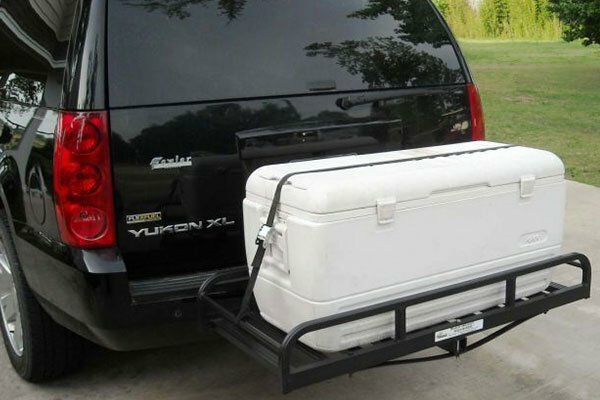 Since the holder can be locked in place, there is no need to fear that it will slip out while you are driving. So, you can be quite certain that your very expensive phone will remain safe and sound. The cradle, as well, offers a good grip on your phone which ensures that it will not shake or vibrate in any way, regardless of the roads that you are driving on. This makes it a lot simpler to see what is on the screen. Thanks to the knob and lever feature, you will find that it is rather simple to set up this holder. What’s more, you will have no trouble placing your phone in the cradle and removing it once more. However, what really sets this holder apart from the others is that the bottommost grip can be rotated at a 90-degree angle. This comes in handy when you are trying to charge your phone. Why we like it: The Mediabridge iPhone Holder is an innovative product that offers users a stable way to keep their phones in place. The adjustable arms on this iPhone holder can be compressed or extended depending on the model of the phone that you have. The width can be changed from 2 to 3.5 inches and thus affords you a much wider compatibility. You will be able to see that the cradle can fit the following iPhones – iPhone 4S, 5, 5C, 5S, 6, 6 Plus, 7, and 7 Plus. This iPhone holder really stands out due to where it is placed in your car. Unlike many other models, this product is actually fastened into your cup holder. 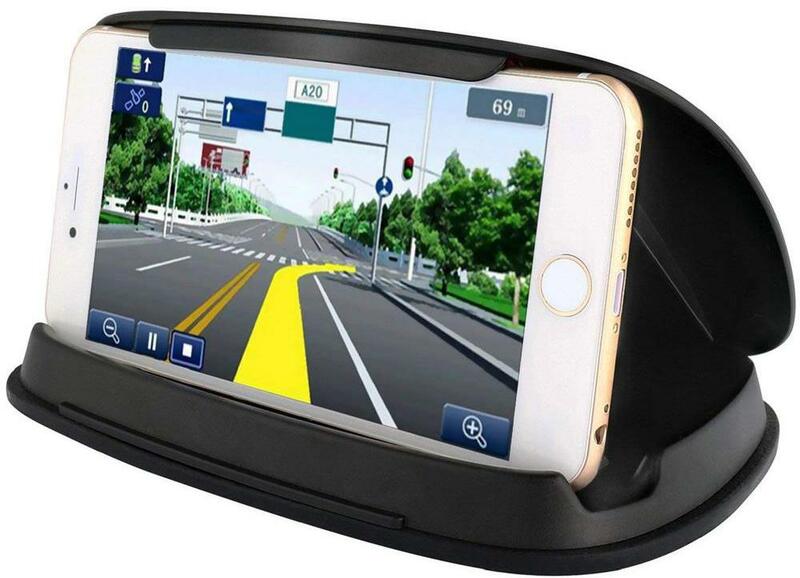 This ensures that, in this position, the holder and phone will not block your driving view and will also not interfere with any of the settings on your car. The base of the holder is suitable for cup holders in most vehicles, regardless of the make and model. Considering the size of the base and where the holder is mounted, you can be quite certain that this is an incredibly firm and sturdy holder. As such, there is no need to be concerned about the phone moving around when you are driving on rather bumpy roads. What’s more, the cradle holds the phone in place as well which cuts down on any vibrations produced by the car. All in all, this holder makes it really easy to view your phone. One of the downsides of this holder is the fact that the setup process is a little bit tricky. See, trying to get the base into the cup holder and facing the right direction isn’t easy. Once in, however, you will find it simple to adjust the cradle in such a way that you can see the screen without any problem at all. Last but not least, your phone can be released from the cradle with just a push of a button. 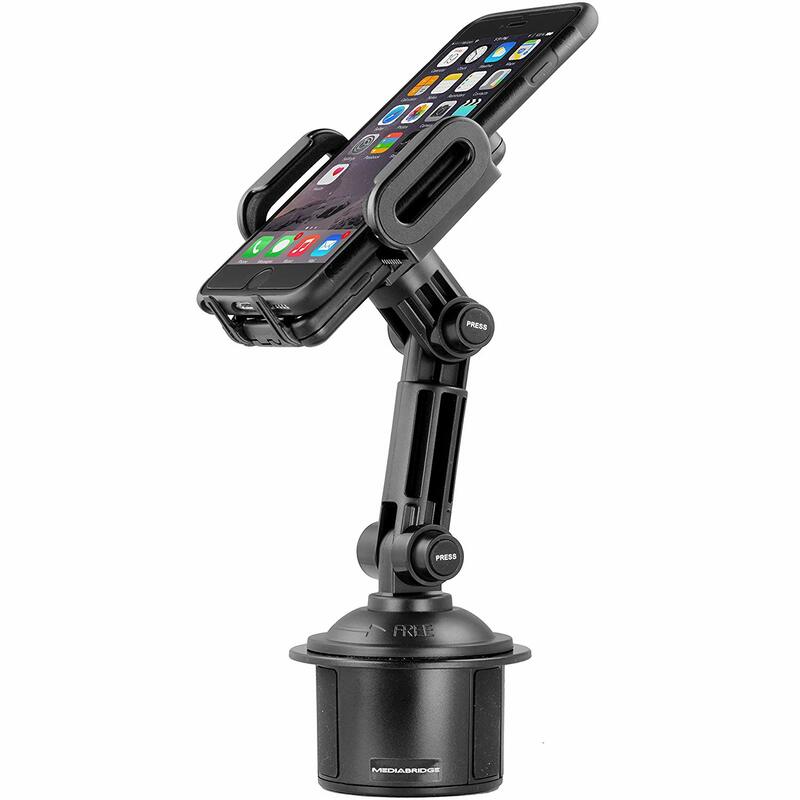 Why we like it: The ARKON iPhone Holder works well for anyone who is looking for a more permanent option in their vehicle. This iPhone cradle has arms that can be retracted or extended, depending on the particular model that you own. The arms can be expanded up to 3.25 inches, which means that they can support a wider variety of models. This includes the iPhone 6, 6 Plus, 6s, 6S Plus, 7, 7 Plus, 8, 8 Plus, and X. There is no denying that the mounting mechanism on this holder is quite a bit different to the other ones in this list. To start with, this holder offers a more permanent option as far as iPhone holders go. This is because it is bolted to the side of your seat. Now, the benefit of this is that the holder stays out of the way of your driving view as well as other settings. Not to mention, it also provides a sturdier base for the holder. Due to the way that this holder is fixed inside the car, you can be quite certain that it is incredibly stable. So, you really don’t have to worry about either the holder or cradle giving way while you are driving. That being said, the holder does have a ‘gooseneck’ feature. This means that at certain points, the holder and cradle may sway a bit, causing the phone to vibrate. Of course, this does only happen when headed out onto rough terrain. Due to the design of the holder, it is going to take a little longer to set up than other holders. However, the instructions are fairly straightforward and with the right tools, it is a relatively easy job. As mentioned, the vibrations of the holder can cause an issue as it can make the screen a bit difficult to see and use. On the other hand, you will have no trouble removing the phone from the cradle as it has a simple release feature. Why we like it: The Bosynoy iPhone Holder lets you keep your phone firm and stable, regardless of the driving conditions. The mouth of this iPhone holder can be extended quite a bit which makes it an excellent choice for some of the larger iPhones on the market. However, it is actually compatible with quite a few models. This means that this holder can firmly hold the following models in place – iPhone 5C, 5S, 6S, 6S Plus, 7, 7 Plus, 8, and X. 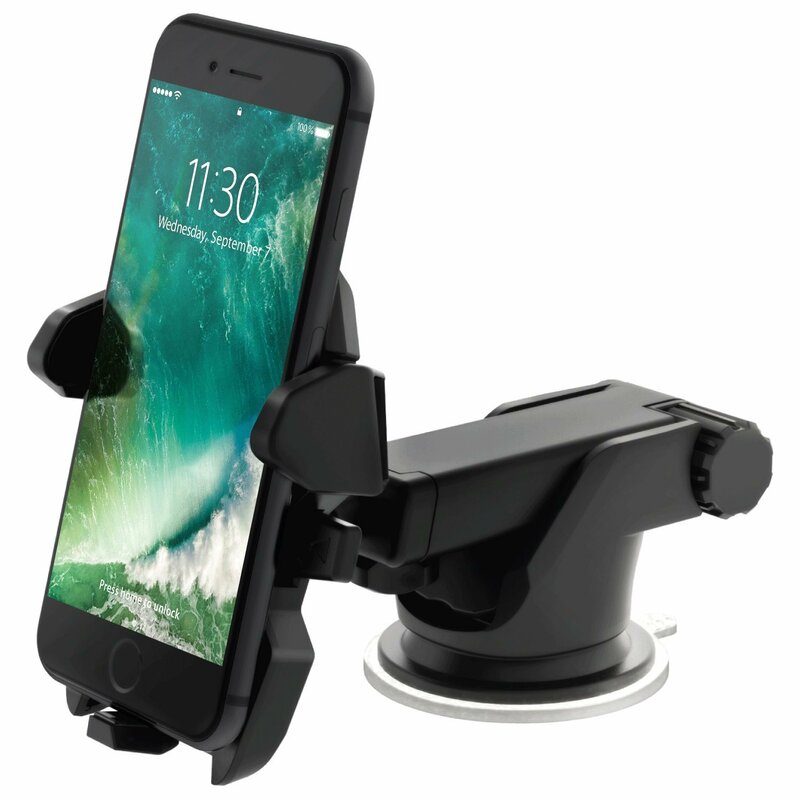 The mounting mechanism on the iPhone holder makes it a good option for anyone who doesn’t want to do any damage to their dashboard. While, technically, this holder does rely on adhesion to keep it in place, it does so with the help of a gel pad. This means that why you get the same benefits as an adhesive feature, there is no sticky residue left behind. Best of all, you can easily remove this holder and place it on a different surface or another car. Due to the size of this holder, it may not be a good fit for all vehicles. If you have a smaller car, you may find that this holder takes up quite a bit of space on your dash. Since the holder is not extended in any way, there is no chance of its stability being compromised. It sits practically flush against the dashboard, ensuring that it will not budge in any way. In the same manner, neither will your phone. Thus, regardless of the driving conditions, you will always be able to have a great view of your phone. For the most part, this holder is really simple to use. It can be set up in a matter of moments and allows you to easily put your phone in and take it out. Unfortunately, due to the design, your iPhone is constantly held in a landscape position and can’t be kept upright. This feature may be a bit frustrating for some users, depending on how you are using your phone. Why we like it: The Cellet iPhone Holder has a great design which ensures that the phone stays in place for the duration of your drive. The expandable arms on this iPhone holder cradle mean that it can support iPhones up to 3.5 inches in width. As a result, you will find that most of the newer iPhone models will be a good fit for this cradle. This includes the iPhone 6, 6 Plus and 7 Plus (with case), 8, 8 Plus, and X. This iPhone holder has a rather interesting mounting mechanism as it is meant to fit inside cup holders. Now, the base of the mount is adjustable but also rather sturdy at the same time. So, this allows it to fit into the wider range of cup holders, regardless of the make and model of the car. At the same time, you can guarantee that the base will not budge at all. The only issue with this holder is that it is not equipped with a vertical extension. Since the mount is practically flush against the cup holder, you are afforded a great deal of stability. So, despite the state of the roads that you may be driving on, you can be certain that the holder will not be jostled around in any way. Also, since the cradle on this holder is well-designed, you can have peace of mind knowing that it will remain in its holder at all times. You will find that this holder is actually quite easy to fit into cup holders and you can have it up and running in just a few moments. Not to mention, it is quite simple to angle the holder so that you can have a better viewing angle for your phone. Paired with the fact that the holder keeps your phone in place at all times, you can be fairly certain that it is easy to use your phone. The main downside with this holder is its lack of length. Due to this, some drivers may find it a tad bit difficult to keep glancing at their phones while driving. Why we like it: The Auto Tech iPhone Holder offers you a sleek yet stable option to keep your phone in place at all times. Although the arms on this iPhone holder can’t be retracted or extended, it is still compatible with quite a number of models. In fact, you will find that iPhone 5, 5S, SE, 6, 6S, 7, 7 Plus, 8, 8 Plus, and X can all be snugly fit into this holder. So, if you have a newer model, you should have no problem finding a good match for your phone. The mounting mechanism on this holder is such that it can be clipped on to the air vents in your car. Due to the design of the grip, you will see that the product is suitable for smaller and larger vents. It also works with both horizontal and vertical vents as well. The main issue with this type of mounting mechanism is that it can often end up blocking the vents. So, during periods of extreme temperatures, you may have to change the position of the holder and your phone. The design of the cradle and the mounting mechanism makes this an incredibly stable holder to own. So, you can be quite certain that neither the phone nor the holder itself is going to budge at all. Even if you aren’t driving on the most ideal road conditions, you will find that you won’t have to worry about being able to view the phone screen perfectly. This is actually a rather user-friendly holder. For one thing, it takes you just moments to set it up and begin to use the holder. For another, since it is so stable, you will always be able to use your phone with just a glance. There is a small issue, nonetheless, and this is the fact that this holder can’t actually be angled towards you. So, it can be difficult to get the ideal viewing position for you. Why we like it: The iOttie iPhone Holder is a unique and versatile product that lets you keep your phone close to you and in place while driving. The arms of the cradle on this holder can easily be extended. So, the width that it can hold onto can change from 2.3 inches to 3.2 inches, making it a good holder for a rather wide variety of iPhone models. You can easily fit the iPhone 4S, 5, 5c, 5S, SE, 6, 6 Plus, 7, 7 Plus, 8, 8 Plus, and X. The mounting mechanism on this holder is actually quite marvelous. This is because it utilizes a sticky gel pad to keep the entire holder in place. The main benefit of this is that the adhesive is very, very strong. This means that you don’t have to be concerned at all, that the holder will move in any way at all. This is despite the road conditions where you are driving. At the same time, this adhesive can be a disadvantage as well. If it is placed on more delicate materials such as leather or vinyl, there is a chance that the dashboard may get damaged. Considering that the adhesive base for this base is so strong, you can be certain that the bottommost portion of the holder will remain well planted. However, due to the extension mechanism of the holder, the same can’t be said for the upper part of it. Here, you may experience some vibrations since the arm is not very rigid. There is no denying that it is incredibly simple to set up this holder. What’s more, you can actually remove it and fix it in another vehicle, even though it relies on adhesion. As long as the arm isn’t extended, you will be able to see and use your screen properly. This, of course, can change if you choose to extend the cradle out. You can also angle the phone so that it is easier for you to view. Last but not least, you can release your phone with just a push of the buttons. There is no denying that this is one of the most popular options as it allows people to keep their iPhones as close to them as possible and at the right viewing height as well. This makes it a lot easier to reach the screen or look at directions while you are driving. The main issue with these holders is that you have to be careful about the mounting mechanism. While the holder should be tightly fixed to the dashboard, it is also important to make sure that the fabric isn’t damaged at all. It should also be noted that holders in this position are often exposed to a great deal of heat and sunlight. Thus, they have a tendency to wear out a bit sooner than most. Many of the holders that are placed on the dashboard can also be placed on the windshield. That being said, these models aren’t actually too popular. This is because due to their mounting position, they can block your view while driving. Not to mention, they are a bit of an eyesore as they are quite visible to those outside of your vehicle. Last but not least, much like with the dashboard holder, these are also exposed to the sun and heat quite a bit and can degrade. These holders can be easily clipped onto your air vent which means that they are a good fit for most cars. Of course, you should keep in mind that the holders are best suited to vertical and horizontal vents rather than circular ones. These holders certainly are a great place to keep your phone, especially as the device can be placed closer to you. The issue, nonetheless, is that the vents are blocked which means that your access to cold or warm air is limited. As the name suggests, this phone holder is mounted inside the CD slot holder. Now, since most people don’t actually utilize their CD slots anymore, this is actually a rather handy option. This is especially considering that the holder is stable while also allowing the phone to be nearer to you. At the same time, there are some downsides. For instance, there is a chance that this particular mechanism can damage the slot in certain situations. Also, the placement of the holder can also prevent you from easily using other dashboard controls. Last, but certainly not least, are the cup holder mounts. These are a relatively new design and allow you to keep the holder in your cup holder. The main perk with this option is that it offers you an incredibly firm and stable base, making it unlikely for the holder or your phone to budge in any way at all. It also ensures that your driving view isn’t obstructed at all. The biggest problem with these holders is that they take up space meant for your drinks and also can be a bit of an odd viewing angle for some drivers. Now, not all holders are equally as suitable for each iPhone model. This is because the cradles on these holders differ in the size of phones that they can handle. That being said, you will find that most cradles have been designed to be well-suited to most modern models. Also, since the arms tend to be adjustable, it is a little easier for you to find a good fit for your phone. To really be certain that your smartphone will fit in the holder, though, you should always compare measurements. First, check the dimensions of your iPhone model – you can either measure it yourself or go to the Apple website. Next, look at how much the arms of the holder can be retracted or extended and determine if this space is enough for your phone. You don’t need to be told that while you are driving your full attention needs to be on the road and maneuvering the vehicle. This is why you will need a holder that doesn’t require any hassle on your part. For instance, when choosing a holder, make sure that the phone can be angled towards you. This way, you will not have to crane your neck to see what is on the screen. You should also find it relatively easy to place and remove the phone from its cradle. Ideally, you should be able to do this with just one hand. So, consider holders that can retract or extend their arms with just a push of a button or feature. This cuts down on how much work you have to do. 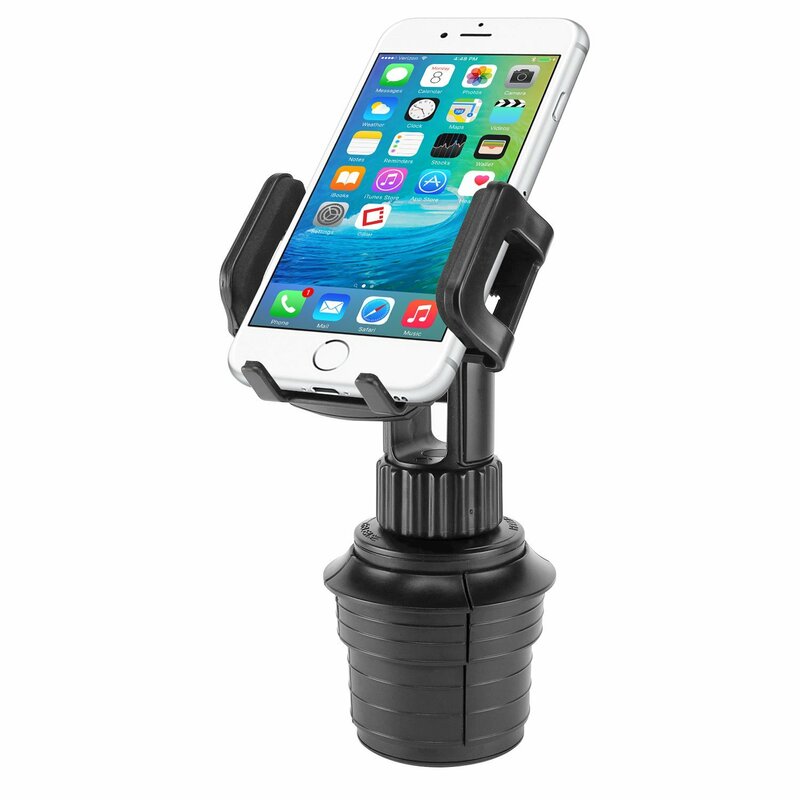 It goes without saying that you also require an iPhone holder that is sturdy and will not become dislodged or fall out while you are driving. Furthermore, you should get one with limited vibrations so that you can see the screen without any issue at all and thus, will not have to look at your phone for too long. This concludes our review and buyer’s guide for the best iPhone holders. As long as you pay attention to the information in this article, you should have no trouble finding the perfect fit for you.